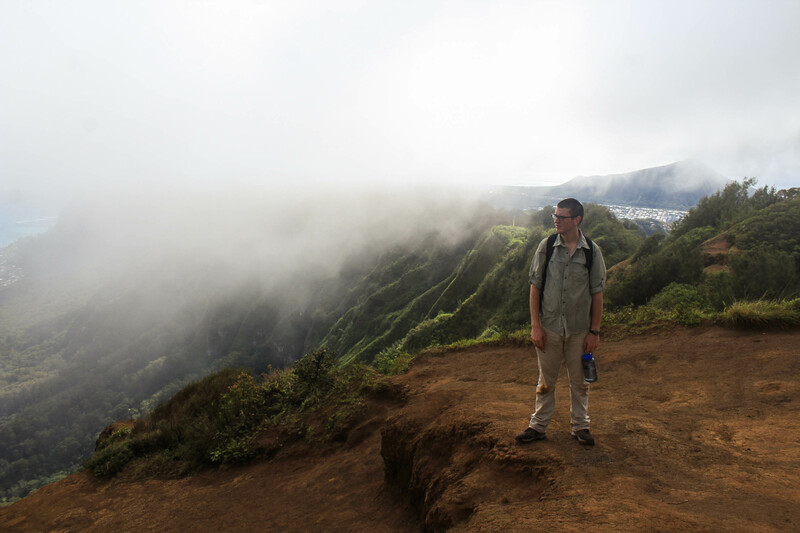 During Curtis’ first week on Oahu before I arrived, he hiked to one peak that has remained one of his favorite hikes so far. Of course I wanted to experience it for myself, so while Curtis still has weekends free, we set off to hike it early one morning. 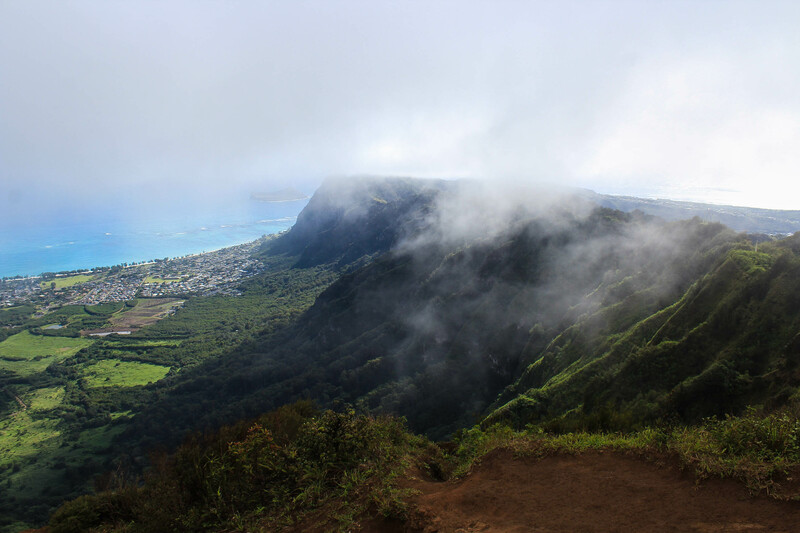 While there was no rain predicted, there were clouds obscuring the peaks of the Ko’olau’s, but we didn’t let this deter us from the hike. The clouds seemed to be moving quickly, and clear skies would come later. 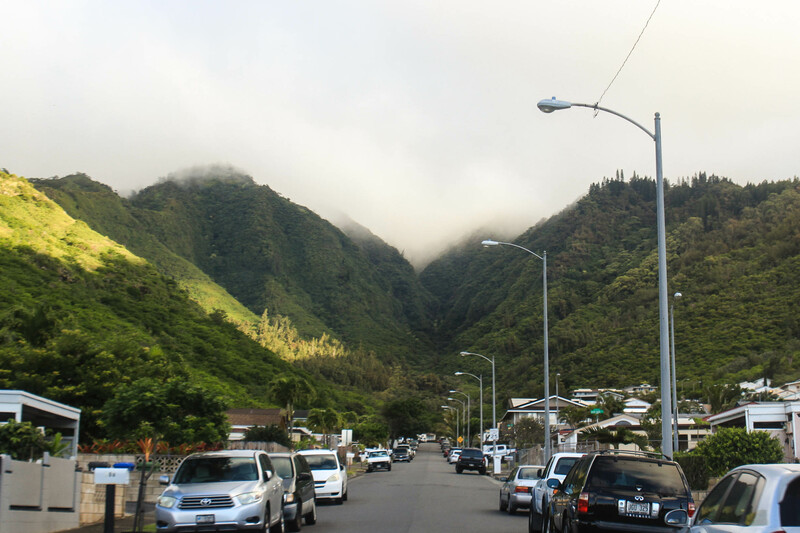 Kuli’ou’ou Ridge begins at the end of a residential street on the South shore of Oahu near Hawai’i Kai. There’s no assigned parking for this hike, so you have to park along the neighborhood streets, and those fill up fast. We were lucky to find a spot within a tenth of a mile from the start of the trail. We walked up the street, then started on the paved trail into the forest. The trail soon turned off from the pavement (actually a road to a water collection facility) and started up through the dense tropical forest. The trail ascended a series of switchbacks rising to the crest of a ridge and passing through the tropical forest into the more temperate zone of Cook Pines, Eucalyptus, and the occasional stand of Norfolk Pine. The trail offers little in the way of views for the first two miles, but for the amateur botanist it offers a plethora of different species. Once we made the ridge, the hike became increasingly steeper as the trail headed toward the summit. 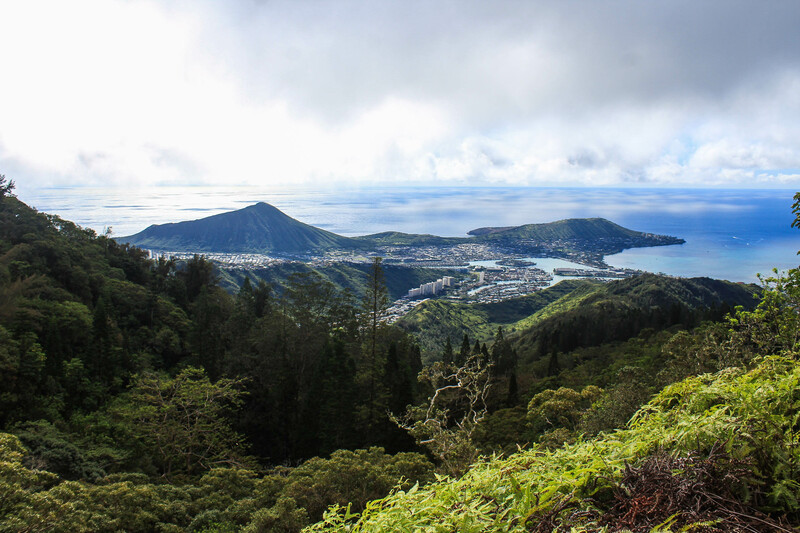 After the trail cleared the tops of the trees, we began to have some views to the South to Koko Crater and Koko Head, and West towards Waikiki and the continuing Ko’olau range. Clouds were still covering the top of the ridge, but they were moving quickly and the views were constantly changing. The end of the trail consists of walking up many sets of stairs, there to aid in preventing erosion. We finally made it to the peak, and found it to be completely empty. Curtis was surprised, because when he hiked this in late September it had been rather crowded. The visibility wasn’t great, but we sat down in hopes of getting a view. Sure enough, we were rewarded for our patience, and watched as the clouds rapidly revealed different scenes. First, it cleared straight to the East, and we saw the bright blue water at Waimanelo Beach. There were farmlands between the foothills and the coast. We got some good glimpses of the Ko’olau Summit to the South, all the way down to the Makapu’u lighthouse and islands off the coast. Finally, we were able to see to the Northeast, where we pointed out Bellows Airfield and the Ka’iwa ridge that we had just hiked one week prior. It was absolutely worth the hike up — however, I’d love to return one day when it’s all clear at the same time. When Curtis hiked this on his own, he made it a loop trail and followed the KST. Someday I’d like to try that as well, but with the limited visibility, this didn’t feel like the right day to try. He said that what made it worth it was the great views to the South, and while we had gotten glimpses of these views, it didn’t appear that the clouds were going to cooperate. Also, the other trail descends rather steeply down with ropes for steeper drop offs, making it more strenuous and dangerous. We may try going up that way next time instead, as going up that sort of trail tends to be safer than going down. For today, we returned the way we came, now passing many people on their way up. As we drove away, cars were parked all the way down the road and on other cross streets, adding at least another mile to the hike. The moral of the story (and most stories on Oahu): arrive early! Altogether, the hike was just under 5 miles round trip and gained 1673 feet of elevation (starting at the trailhead, not including walking through the residential street). We decided to take our time driving back, and make some stops along the South shore. Our first stop was at the Spitting Cave. 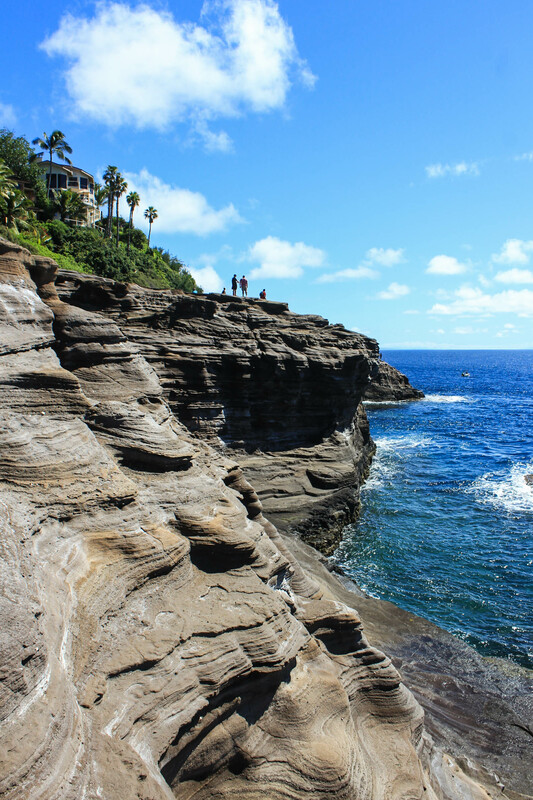 We were pleasantly surprised to find that it wasn’t as busy as other places along the drive, and as always, I loved walking along and exploring the rocky cliffs. Wandering further West gave unique views of Diamond Head. Today was exceptionally clear, so we were able to see Molokai, Lanai, AND Maui in the distance. 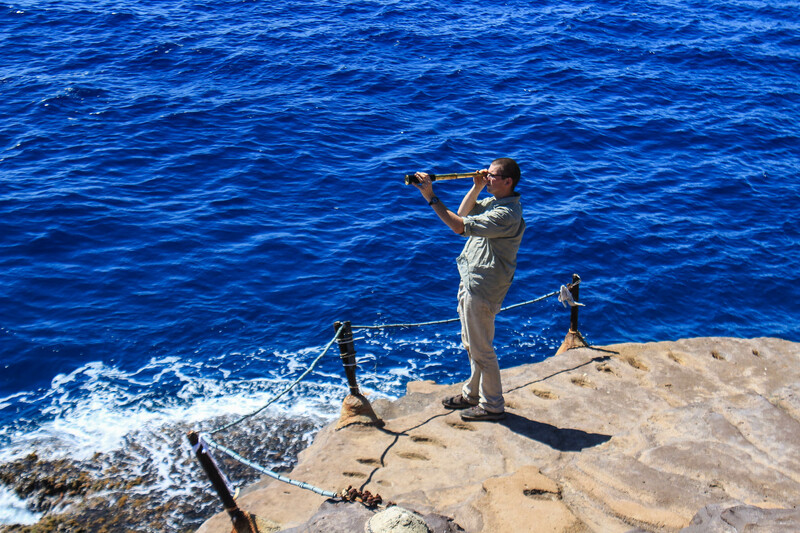 We kept our eyes out for whales, but weren’t able to see any. Our last stop of the day was to check out Bellows Air Force Beach. Since we’ll have visitors coming soon, I wanted to check out a few more beaches and be more familiarized with what to expect. This beach had great views of the surrounding coast and mountains in either direction, so naturally it was a winner to me! We returned home after another beautiful and exciting day of exploring our island home.